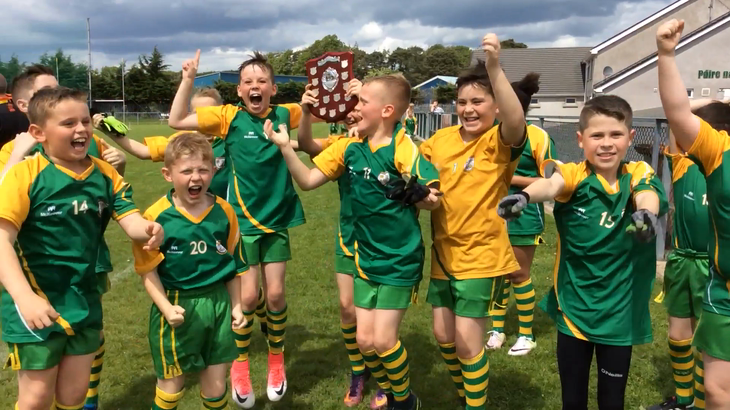 St. Patrick’s PS do the double and win the Brother McDermott Shield! St. Patrick’s Primary School travelled to Armagh on Friday to compete in the Edmund Rice Schools Cup. The sun was splitting the trees and it was perfect conditions for a day of Gaelic Football. The boys and girls from St. Patricks had been putting in hours of preparation training every week after school and could not be any more prepared for the challenge that lay ahead. In a tough group St. Patrick’s battled fiercely against Abbey CBS and Holy Family CBS, a late point against Abbey from Kieran Ward qualified St. Patrick’s for the semi-final of the Brother McDermott Shield. The Semi-final was an all Belfast affair, with St. Patrick’s drawing John Paul the second. The North Belfast outfit had been steadily growing throughout the competition and things looked to be coming together at the right time. St. Patricks dominated the game but struggled to convert their chances into scores, Kieran Ward hitting the post from distance and Aisling Marcus hammering the ball just the wrong side of the net. Then came a moment of inspiration from St. Patrick’s, Padraic O’Rourke broke the ball to Shea Canavan who found Deaghlan Shannon bombing off his shoulder, through a sea of men before firing the ball over the bar to send his team into the final. In the final the challenge of Abbey CBS awaited, a team who St. Patricks had already met in the group stage with Abbey coming out on top but St. Patricks had been growing in confidence and fancied themselves regardless of the competition. St. Patrick’s picked up from where they left off in the semi-final with a beautiful free flowing move started by Conor Haughey. Conor beat two men before switching flanks with a pin point kick pass to find Seamus Kelly who had left his marker in his trail, then composed himself to place a wonder score over the bar from distance to put St. Patrick’s in the lead. Abbey were beginning to find their rhythm and demonstrate exactly why they had reached the final hitting St. Patrick’s on the counter attack and levelling the score. Pearse’s man Kevin Breen showed great leadership marshalling his back line brilliantly as Abbey continued to pile on the pressure with wave after wave of attack being repelled by the St. Patrick’s defence. However it was a real display of courage and bravery from Aaron Braniff that really stood out in the final. Aaron unselfishly hurled himself to make numerous last minute blocks on Abbey forwards to keep his team in the game, even hurting himself twice in the process. But this epitomised the hunger and desire from St. Patrick’s who refused to be beaten. At half time St. Patrick’s rallied each other to give everything they had in the second half. The second half was another great spectacle of Gaelic football with end to end fast paced attacking football. Nothing was separating both sides and looked certain to be heading for extra time. Then Pearses man Conall Rooney in goal continued his fine display with a great kick out that found Conor Haughey who launched a ball into the full forward line were Calum Watson rose above two defenders to catch the ball and find Kieran Ward who hit the decisive score of the game. As the final whistle blew scenes of pure elation began with this St. Patrick’s team writing themselves into the history books, being the first team ever to win the Brother McDermott shield and adding to the Casement Cup they had previously won earlier this year. Aisling Marcus, Anthony Magee, Caloum Watson, Conor Haughey, Shea Canavan, Aaron Braniff (Captain), Conal Rooney, Kevin Breen (Vice Captain), Kieran Ward, Deaghlan Shannon, Seamus Kelly, Ruari McNally, Brendan Walsh-Murray, Padraic O’Rourke and Sean Og Murphy. Scenes of joy as St. Patrick's are crowned champions! 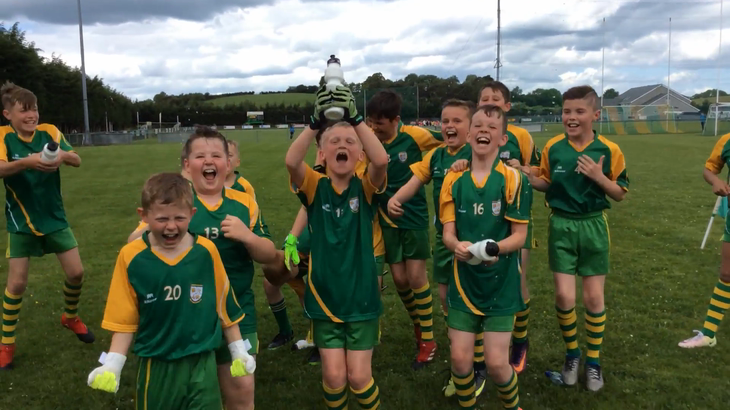 St Patrick’s Primary Gaelic Football team crowned Casement Cup champions!! St Patrick’s Gaelic Football team have been crowned 2016 Antrim Allianz Cumann Na Mbunscoil Casement Cup champions. The boys topped their group with a 100% record and faced a real challenge in Holy Rosary in the final. The South Belfast side had real pace and moved the ball brilliantly to their forwards. However, the tireless work and tackling of Kevin Breen, Aaron Braniff and Conor Haughey was magnificent as the Holy Rosary forwards struggled to get their shots away. Seamus Kelly was finding space on the flank and was linking up brilliantly with Deaglan Shannon who played a wonderful ball into Kieran Ward in the full forward line. The Pearse’s man beat two defenders before firing the ball off the crossbar and into the back of the net. It truly was such an end to end attacking game but another flowing move from St. Patrick’s saw Daniel Mateer O’Reilly going through on goal hammering the ball past the goalkeeper giving St. Patrick’s a six point lead at half time. In the second half St. Patrick’s really found their rhythm with Padraic O’Rourke and Sean Moore kicking four points without reply. Holy Rosary regrouped and began to find their danger men scoring a goal and two points. With Holy Rosary on top St. Patrick’s relied heavily on the heroics of Pearse's man Conall Rooney in goals who made a string of crucial saves to keep their lead intact. Anthony Magee and Finlay McMullan were winning a lot of breaking ball in the middle of the park as Sean Moore and Padraic O’Rourke added to their tally in the last moments of the game. The introduction of fresh legs from Corey Ward, Finn Cahalan, Beon Benoy, Aiden Nugent and Tiernan Rice ensured St.Patrick’s were crowned 2016 Antrim Allianz Cumann Na Mbunscoil Casement Cup champions. A very jubilant Mr Carter said he was extremely proud of all the boys who represented their school fantastically well. They are a real credit to their school and their families in how well they have conducted themselves both on and off the field. They gave their all both in every training session and every game and I could not ask any more from them. A fantastic group of boys who have really showcased what footballing talent there is in North Belfast. Mr Carter also wished to thank all parents who supported the team throughout the campaign and Mrs McKeever for ensuring the boys arrived safely at every game. St. Patrick’s will now be looking forward to build upon their outstanding performances this year. After picking up points against Bunscoil Bheann Mhadagáin and Holy Family, St. Patrick’s now faced Sacred Heart in their final Andy McCallin Cup group game. The winners of this highly contested game would be guaranteed a spot in the Casement Cup final. Late St. Patrick’s flourish clinches first win of the season. St. Patrick’s Primary School took on Bunscoil Bheann Mhadagáin with the sun splitting the trees for their opening game of the Allianz Cumann Na Mbunscol Andy McCallin Cup. St Patrick’s started the brighter of the two teams with Padraic O’Rourke firing home a goal with the first shot of the game. After a very competitive start St. Patrick’s began to find their rhythm as Sean Moore took a brilliant point putting St. Patrick's into a four point lead. Some fantastic defending from Finlay McMullan and Aaron Braniff kept the Bunscoil's chances to a minimum however after some great flowing football Bunscoil Bheann Mhadagáin got their first score of the game. Kieran Ward's hard work in the forward line paid off as he won a breaking ball and found space to slot the ball over the bar. St. Patrick’s continued to take the game to Bunscoil as Sean Moore scored his second point of the game giving St. Patrick’s a 5 point lead at the break. Bunscoil Bheann Mhadagáin came out of the second half the brighter side scoring two goals and a point in quick succession. With Bunscoil on top St.Patrick's relied heavily on Pearse's man Conall Rooney in goals who made a string of crucial saves. St. Patrick’s began to find their feet in the second half as Seamus Kelly confidently took a well worked point. However, Bunscoil Bheann Mhadagáin continued to build on their second half momentum scoring an impressive goal. St. Patrick’s replied with a Conor Haughey goal as he drove down the flank cutting inside to hammer the ball into the back of the net. Bunscoil Bheann Mhadagáin again rallied going through on goal however a selfless block from Deaglan Shannon allowed St.Patrick's to counter with Anthony Magee moving the ball swiftly up the field finding Sean Moore who slotted over from the half forward line. With the game in the balance the midfield duo of Sean Moore and Deaglan Shannon broke the ball to Padraic O’Rourke who swivelled past two Bunscoil defenders to score a fantastic individual goal. Padraic O’ Rourke's scoring continued as he placed two wonderful points over the black spot under great pressure in the dying moments of the game giving St. Patrick’s their first victory of the season. What a great exhibition of football in North Belfast from both sides however St. Patrick’s will be delighted with the win after returning to competitive football following a two year absence.